Waikiki's largest cast show combines powerful performances with rock n roll, Hawaiian and Polynesian music! Rock-A-Hula’s home is the 750-seat, multimillion-dollar Royal Hawaiian Theater. Be our pampered VIP! 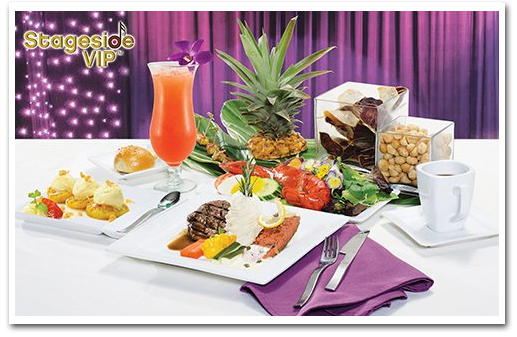 Start your evening with party pupus and mai tai at the VIP Lounge reception, then enjoy dinner and the show at your own private stageside table. Come to the show born in Paradise, with the energy of a volcano and the star-power of a Vegas review. Tribute artists like “Elvis” take you back to ‘60’s Hawaii. 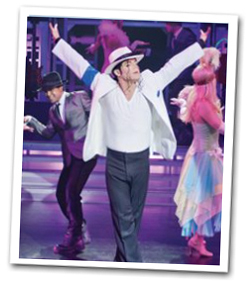 “Michael” and “Celine” dazzle you with mega multi-media performances. Book your dinner and show packages now for one of Waikiki's hottest shows! World-famous Legends in Concert of Las Vegas presents an interactive show created especially for Hawaii, "Rock-A-Hula®!" As the pioneer of live tribute shows, Legends has access to the best tribute artists in the industry, who not only look and sound like the star they portray, but are true performers in their own right. 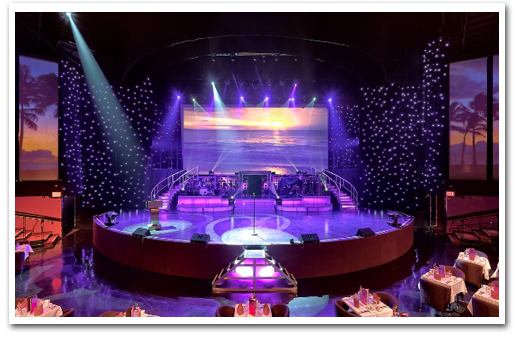 Legends Artists® sing their greatest hits with their own natural voices, as well as dance and play instruments, accompanied by a rockin' live band and fabulous dancers. In circumstances beyond our control, the Legends Artists® line up may change. Johnny Fortuno, a local boy from Oahu, was recognized at an early age by Don Ho and became a part of his famous Waikiki show. 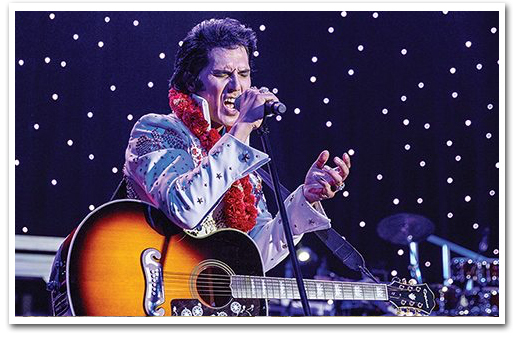 At 18, Johnny was the youngest Elvis tribute artist to hit the Legends’ Las Vegas stage.A top 10 finalist in the Ultimate Elvis Competition in 2011, Johnny sings with the power of the King. 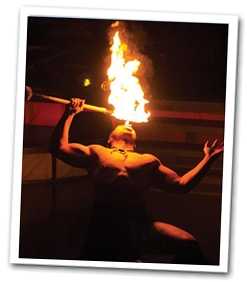 Fire knife dancing is an honored Samoan tradition. The twirling of the burning nifo oti (war knife) is a skill that has been refined from generation to generation. Performed by Lafo Brown and Chief Tui, fire knife dancing brings Rock-A-Hula to a burning crescendo. Chicken or vegan dinners available with 48 hours notice. Rock-A-Hula® is open six days a week. The show is dark on Fridays. In addition, the show is closed on Monday, 7/4/16, Friday, 12/9/16 – Sunday, 12/11/16 and Friday, 3/3/17 - Sunday, 3/5/17. 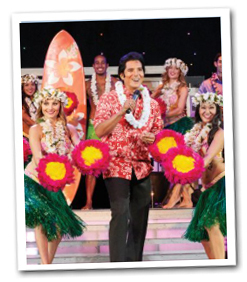 Venue: The $20 million Royal Hawaiian Theater® is the home of the nightly Rock-A-Hula® show six days a week. It is also Oahu’s premier meeting space and event venue in the heart of Waikiki featuring a 750-seat theater, state-of-the-art lighting, sound and multimedia technology, open-air large cabanas, beautiful bars and dining areas for banquets, presentations and award ceremonies. Transportation Add transportation to your cruise. Motorcoach, Air-conditioned, Round-trip from Waikiki: $14.00 per person. Round-trip Kahala Resort or Ko Olina Resort $33.00 per person. Parking: Parking is available at the Royal Hawaiian Center. To enter the parking garage from Kalakaua Avenue, turn right on Royal Hawaiian Avenue. Then, take the immediate next right up the ramp into the Royal Hawaiian Center garage.With validation from Rock-A-Hula, your parking fee will be discounted. Accessible Accommodations In our Green Room Dinner & Show®, there are some accessible restrictions for guests with wheelchairs on our backstage tour. Contact us to learn more. For all other packages, Rock-A-Hula® offers special accommodations during the show for guests with wheelchairs. A wheelchair user plus one guest may be seated in the stage side area for the show.